Sanford, Florida (CNN) -- Attorneys for neighborhood watch volunteer George Zimmerman, who authorities say fatally shot an unarmed teenager in Florida, said Tuesday they have lost contact with their client and will no longer represent him. "He has gone on his own. I'm not sure what he's doing or who he's talking to," said legal adviser Craig Sonner. "If he wants us to come back as counsel, he will contact us." Sonner, who said the last time they had contact with Zimmerman was Sunday, spoke to reporters in Florida with attorney Hal Uhrig. Uhrig said Zimmerman contacted the office of the special prosecutor appointed to lead the investigation on his own. "One of the things every defense attorney tells his client is don't talk to the prosecutors," said Uhrig, adding that he is concerned about his former client's "emotional and physical safety." "For those of you engaged in the late Easter egg hunt looking for him, you can stop looking in Florida. Look much further away than that," he told reporters. About Zimmerman, Sonner would say only, "He's in the United States." "I still believe that he was acting in self-defense that night. Nothing that I've said about him, or this case, has changed in any way. I just can't proceed to represent a client who doesn't stay in contact with me," said Sonner. Although details of the February 26 incident remain murky, what is known is that 17-year-old Trayvon Martin, an African-American, ventured out from his father's fiancee's home in Sanford to get a snack at a nearby convenience store. Zimmerman told Sanford police the shooting was self-defense. The fact that he has not been charged with a crime has provoked demonstrations and calls for his arrest. Martin's death has triggered a nationwide debate about race in America and Florida's "stand your ground" law, which allows people to use deadly force anywhere they feel a reasonable threat of death or serious injury. 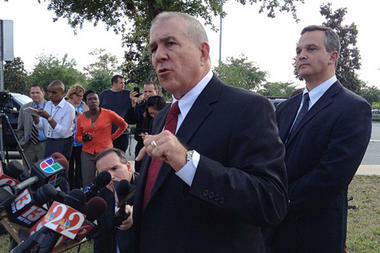 Special prosecutor Angela Corey has not indicated when she will decide whether to file charges against Zimmerman. "The decision should not be considered a factor in the final determination of the case," Corey's office said. But some legal experts say Corey's announcement could signal an imminent decision on Zimmerman. "I would anticipate she will move quickly on this," said Paul Callan, a former New York prosecutor. "I think you'll see her come down with charges probably very, very soon." On Tuesday, Martin's parents, Tracy Martin and Sybrina Fulton, said they were somewhat relieved that a decision on charges would not rest with the grand jury, but rather with Corey. "I have faith in her," Martin said. Zimmerman recently launched a website, to warn supporters about groups that falsely claim to be raising funds for his defense and to solicit donations for himself. "The support has been overwhelming in volume and strength. I thank you all and ask that you permit me the time to respond to each one of you personally," he wrote on the site Tuesday. He included a quote that he attributed to Edmund Burke: "The only thing necessary for the triumph of evil, is that good men do nothing." "I am the real George Zimmerman," declares the website, set up over the weekend. "On Sunday February 26th, I was involved in a life altering event which led me to become the subject of intense media coverage. As a result of the incident and subsequent media coverage, I have been forced to leave my home, my school, my employer, my family and ultimately, my entire life. This website's sole purpose is to ensure my supporters they are receiving my full attention without any intermediaries." The statement posted on therealgeorgezimmerman.com warns viewers that "some persons and/or entities have been collecting funds, thinly veiled as my 'Defense Fund' or 'Legal Fund.' I cannot attest to the validity of these other websites as I have not received any funds collected, intended to support my family and I through this trying, tragic time." The site includes a link through which viewers can donate money to pay for Zimmerman's lawyers and living expenses "in lieu of my forced inability to maintain employment." Zimmerman pledges to "personally maintain accountability of all funds received." "I am grateful to my friends that have come to my aid, whether publicly or personally, never questioning my integrity or actions, understanding that I cannot discuss the details of the event on February 26th, and allowing law enforcement to proceed with their investigation unhindered," Zimmerman, 28, wrote elsewhere on the site. "Once again, I thank you for your patience and I assure you, the facts will come to light." Until now, only friends and relatives have come forward to speak on Zimmerman's behalf. Zimmerman's now-former lawyers and a friend confirmed the authenticity of the website. The friend, Frank Taaffe, told CNN sister network HLN that while the site is being used to raise funds for a legal defense, that doesn't mean Zimmerman expects to be charged in connection with Martin's death. "That has nothing to do with it," Taaffe told HLN's "Issues With Jane Velez-Mitchell." Fulton said Tuesday that it's Zimmerman's right to have a website, but Martin said he feels Zimmerman is raising money off his son's death. Benjamin Crump, a lawyer for Martin's family -- which also has a site raising funds to support its efforts -- said it's unfair that Zimmerman is still free to express his views and solicit money. "If the situation was reversed, Trayvon Martin would have been arrested day one, hour one," Crump told CNN's "AC360˚" on Monday night. "We believe Zimmerman should have been arrested and put into jail. This situation with this website is a luxury that Trayvon Martin doesn't have and never would have had." Sanford police questioned Zimmerman and released him without charges. Authorities have said Zimmerman was not immediately charged because there were no grounds, at the outset, to disprove his account that he'd acted to protect himself. Thousands have converged on Sanford to join in protests calling for Zimmerman's arrest and criticizing the police department's handling of the case. A marked Sanford police car was shot several times early Tuesday, authorities said. The car was parked in an elementary school parking lot "as a visible deterrent due to tour buses using the school property to park during the day and evening hours," according to Sanford police spokesman Sgt. David Morgenstern. The buses have been frequenting the area since the shooting, Morgenstern said. There was no one in the vehicle at the time of the shooting, thought to be about 4:30 a.m., police said. Residents called authorities to report shots fired, Morgenstern said. The car was hit "several times," he said. Glass was shattered and the car's body was pierced. Police are inspecting the vehicle in an evidence processing unit, he said. The shooting was the first violence reported that may have been related to Martin's death, Morgenstern said. There were no injuries, and the shooting is under investigation. "The only thing necessary for the triumph of evil, is that good men do nothing." Negative buzzer sound, as the quote comes from Marcus Aurelius.